Although it's possible to lose 4 pounds per week by severely restricting your calorie intake, boosting exercise or combining these two methods for rapid weight loss, medical supervision is a must if you attempt to lose more than 2 pounds weekly. Very-low-calorie diets (VLCDs), which can lead to a 4-pound-per-week weight loss, often come with negative side effects. The Centers for Disease Control and Prevention notes that 1 pound equals 3,500 calories. Therefore, to lose 4 pounds per week, a calorie deficit of 2,000 calories per day is necessary. For example, you could reduce your current calorie intake by 1,500 a day and burn an extra 500 calories daily exercising to lose 4 pounds weekly. But this type of severe calorie restriction is often unsafe without medical supervision because it increases your risk for nutrient deficiencies. A 4-pound-weekly weight loss often requires a total calorie intake of 500 to 800 calories per day. This type of very-low-calorie diet often results in a weight-loss rate of 3 to 5 pounds weekly, notes Weight-Control Information Network. The network, however, also notes that VLCDs often result in weight regain, constipation, nausea, diarrhea, fatigue and gallstone formation. Most VLCDs used under medical supervision consist of nutrient-dense protein shakes or bars fortified with vitamins and minerals to help prevent nutrient deficiencies. If you prefer safe weight loss without the need for medical supervision, the Centers for Disease Control and Prevention suggests losing 1 to 2 pounds per week. 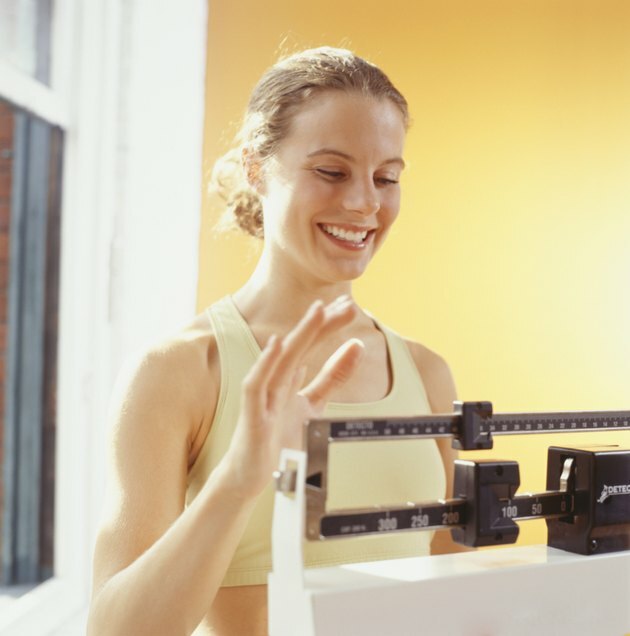 The CDC notes that this rate of weight loss helps keep lost weight off for good. Many effective weight-loss diets contain 1,200 to 1,600 calories per day. Harvard Health Publications suggest that women avoid eating fewer than 1,200 calories daily -- and men should eat a minimum of 1,500 calories per day during weight loss. To help control your calorie intake – and feel full – during weight loss, eat plenty of low-calorie, satiating foods. Protein-rich foods -- such as egg whites, lean meats, skinless poultry, seafood, legumes, seitan, soy products and low-fat dairy foods -- help you feel full better than carbs. Fill up on low-calorie, fiber-rich foods -- such as fruits, vegetables and whole grains. Try drinking a cup of water before meals to further boost satiety and decrease your caloric intake.